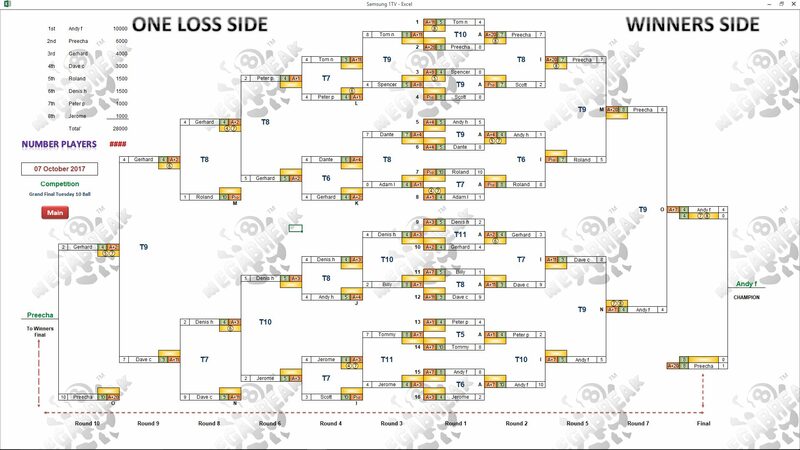 TUESDAY 10 BALL GRAND FINAL : ANDY IS CHAMPION. 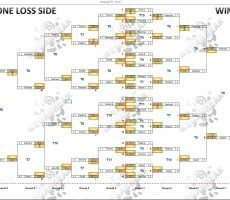 Congratulations go to England’s Andy Featherstone for winning our 10 Ball Grand Final for Season 16 on Saturday evening. He was in top form to remain undefeated all night long, through five consecutive matches and lift the trophy. 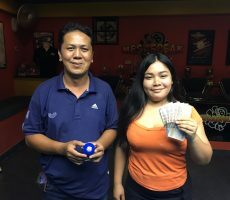 From the full entry of 16 players, he comfortably beat Thailand’s Preecha in the final by 4 racks to 1 (race 4-8), to collect the 1st Prize of 10000 baht. Preecha once again played as consistently as ever to finish as Runner-Up, taking home 6000 baht. 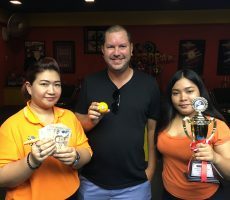 Next in the field was Germany’s Gerhard Schebler in 3rd Place, receiving 4000 baht, and he was closely followed by Dave “Granite” Chalmers from England in 4th, winning 3000 baht. As always, half the field made a return on their investment on the night. 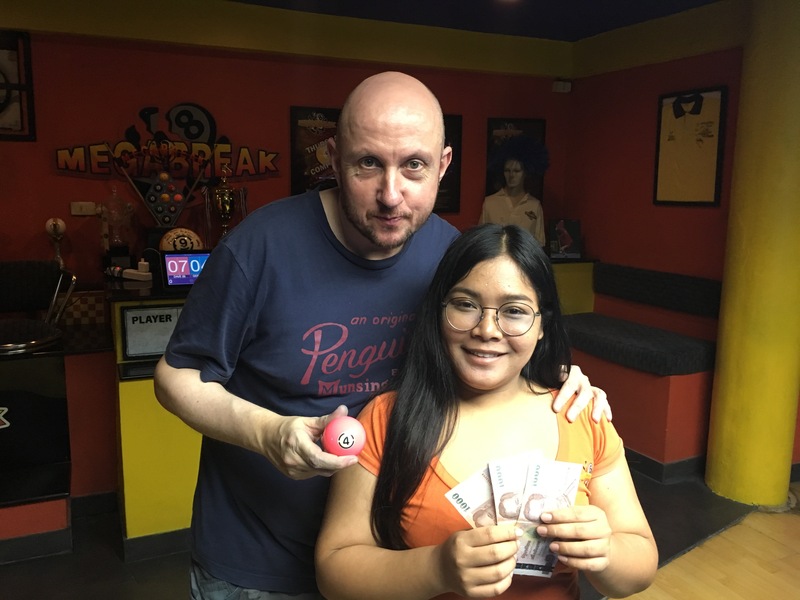 Winner : Andy F (A+7) – 10000 baht. 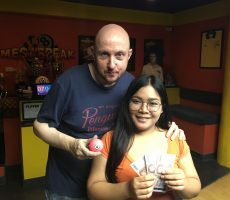 Runner-Up : Preecha (A+20) – 6000 baht. 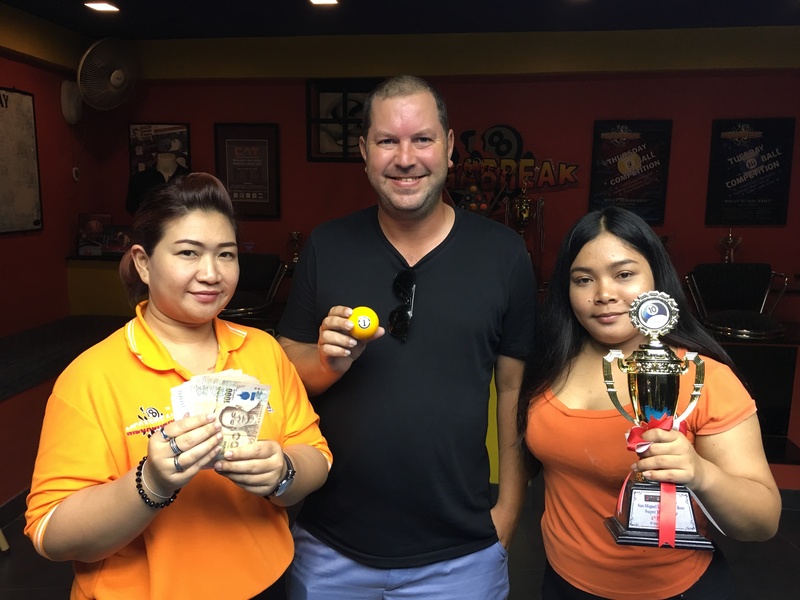 3rd Place : Gerhard (A+2) – 4000 baht. 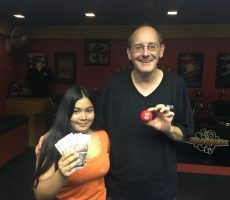 4th Place : Dave C (A+11) – 3000 baht. 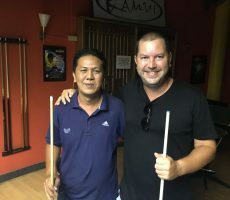 Equal 5th Place : Roland Garcia (Pro+) and Denis Husson (A+3) – 1500 baht each. 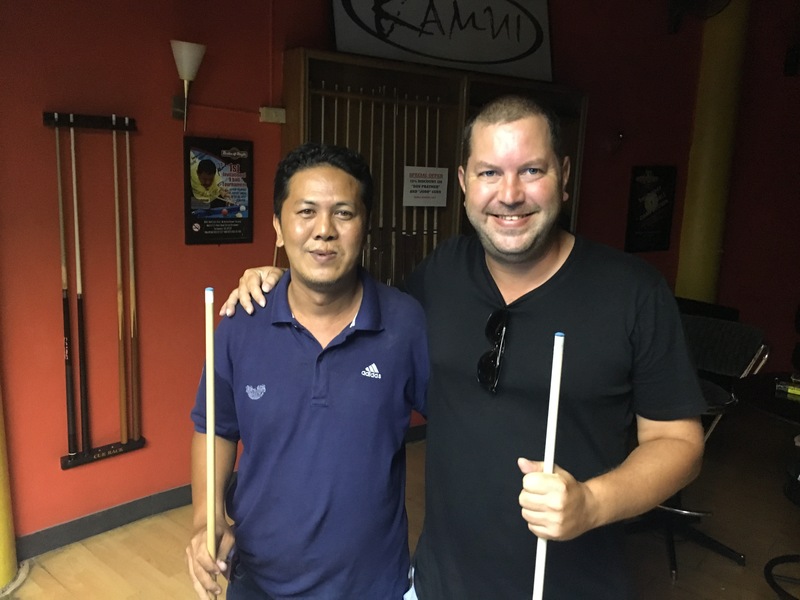 Equal 7th Place : Jerome Pierron (A+3) and Peter Pellack (A+1) – 1000 baht each. The Player Auction created an extra Prize Pool of 19200 baht and was dominated by Dave Chalmers. 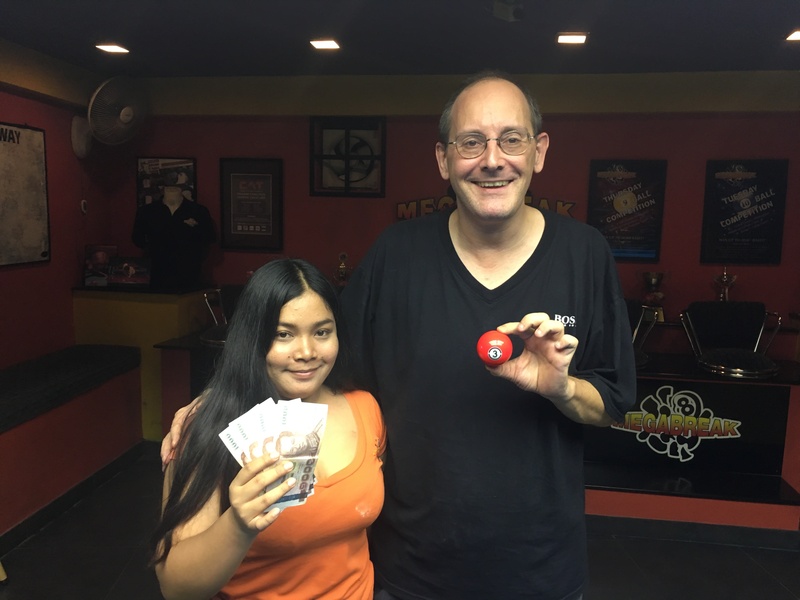 He bought 3 of the 16 players, but still managed to get both the 1st and 3rd Place finishes. 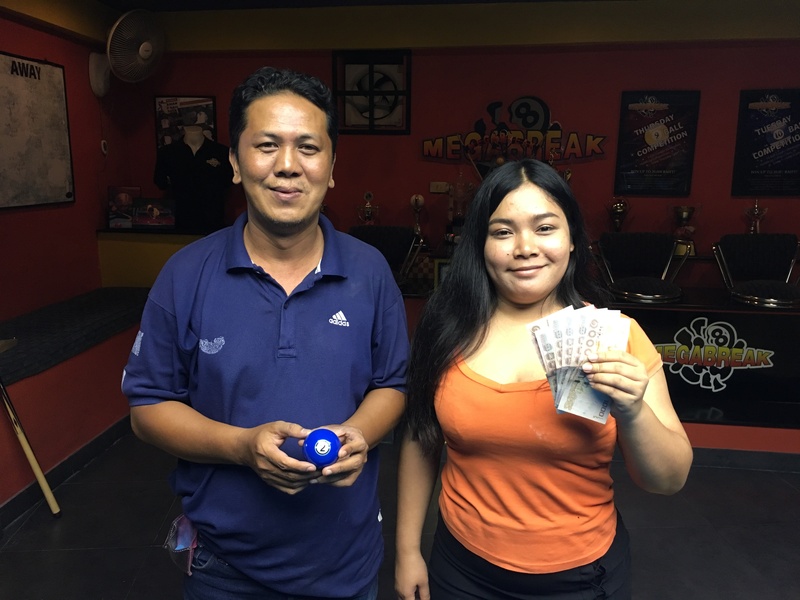 He purchased Andy for 1300 baht and Gerhard for 500, and collected the 1st Payout of 7600 and the 3rd of 3800. 1st (40%) : Dave (Andy) – 7600 baht. 2nd (30%) : Billy Hayes (Preecha) – 5800 baht. 3rd (20%) : Dave (Gerhard) – 3800 baht. 4th (10%) : Jay-r (Dave) – 2000 baht.